Every year Gensler is asked to participate in all kinds of pro bono efforts. And, sometimes we take on tasks just to accept a creative challenge. 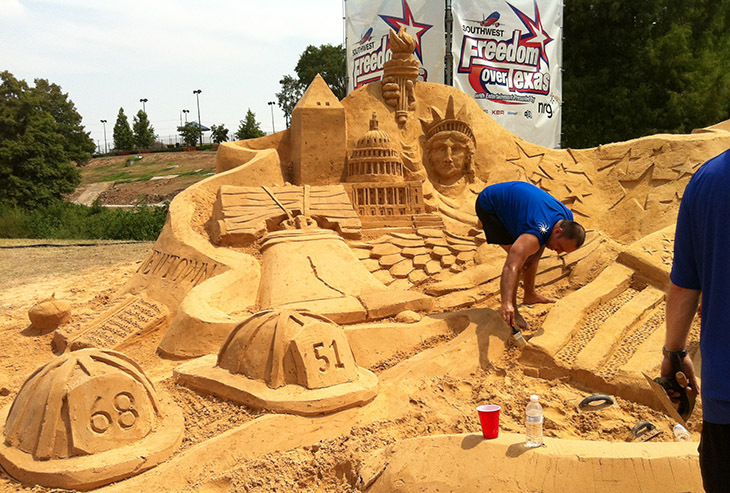 So, when Houston Mayor Annise Parker asked Gensler’s Houston office to build a patriotic-themed sand sculpture for the city’s 2013 Freedom Over Texas Festival, we assembled a team and got to work. We were feeling pretty confident, having just brought home both the Golden Bucket (First Place) and “Best Traditional Sandcastle” at the annual AIA Sandcastle Competition at East Beach in Galveston. We beat out over 60 design/construction teams with our “Scary Tales” sandcastle being attacked by a dragon. The mayor’s sand sculpture was a much bigger challenge. Not only did the scale need to be three times larger than anything we had ever attempted before; we also needed to complete it within 48 hours and incorporate tributes to victims of Newtown, CT; Oklahoma City, OK; Houston, TX; West, TX; and Boston, MA disasters. The site was a heavily trafficked downtown city park filled with bikers, runners and neighborhood kids. Planning for this massive effort began a month before the event. The 24 Gensler team members were asked to submit their design ideas. We recruited Harvey to help us do the form work and make sure that our concept was buildable. We refined the original design concepts and asked Luke Scott and Cait McMillen to refine their designs in clay scale models that could be presented to the city. We presented the design to the city for their approval. They made minor modifications and Harvey weighed in on the best way to build it. We finalized the design, determined the amount and type of sand needed (130 tons of bank sand), assigned different elements of the sculpture to individual team members and assembled the equipment needed. Ten dump truck loads of sand were delivered to the site about a week before the event. Actual construction work began at 7:30 AM July 3 when the Harvey crew began compacting the sand and creating the forms. Work on the forms was completed about 3 PM that day and the Gensler sand crew went to work sculpting the tallest elements first and working down. The team worked late into the day in temperatures that hovered around 98 degrees. Luke Scott and Joy Hughes volunteered to spend the night at the sight to make sure no overeager neighborhood kids or passersby decided to add their own touches. The full team resumed work on July 4 around 7 AM and worked throughout most of the day, finally putting the finishing touches on around 3 PM just in time for the festival gates to open at 4 PM. More than 100,000 people were in attendance. 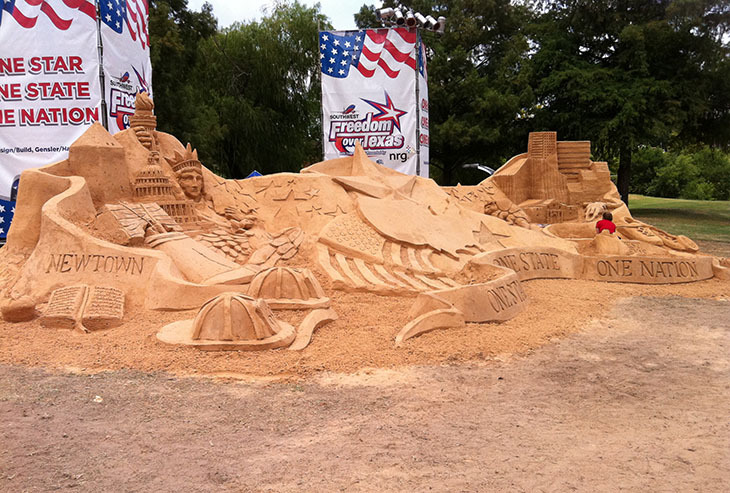 The sand sculpture was one of the most popular venues attracting scores of people throughout the day. Visitors included the Mayor and her security detail. She was amazed at the scale and detail of the sculpture. That night, lighting effects washed the sculpture in colored lights. It formed the perfect setting for the amazing firework display that rose directly behind the sculpture. 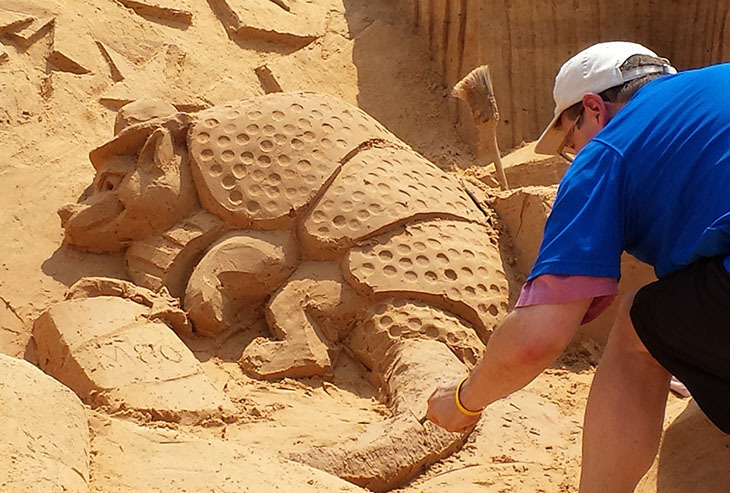 The sand sculpture was showcased as the centerpiece of the whole event. Would we do it again? We probably would. It was great to be part of an event that celebrated our nation and our state and that introduced what we do to a whole new audience. We fielded questions all day from media and visitors about Gensler, design and construction. Ann handles all things PR for Gensler’s SC region which encompasses Texas, Louisiana, Oklahoma and New Mexico. She spends her days promoting Gensler people, projects and ideas to clients, the general public and the media. She also facilitates our talking among ourselves. She was the initial liaison for Freedom Over Texas with the mayor’s office and was instrumental in recruiting a talented team of 24. The event was covered by every local news outlet and Ann was the primary spokesperson. Contact her at ann_kifer@gensler.com.